The 5777 Ruth Fredman Mother-Daughter Bat Mitzva Program will be announced soon. This 10-week program meets on Sunday evenings beginning in January. This program is sponsored by Aaron Fredman in memory of Ruth Fredman, a”h. Centering around the theme “Jewish Women through the Ages,” the program explores the lives of ten Jewish women through textual study and creative experiential activities. Ruth Fredman was passionate in her support of the creative arts and of women celebrating their Jewish heritage. She encouraged her granddaughters to study Jewish sources at the highest level, but at the same time to rely on different modes of self-expression. She embodied the positive attributes and values of a female role model. The MaTaN Bat Mitzvah Program has enriched the Bat Mitzvah experience of over 3,200 mothers and daughters on four continents. Now the Torah MiTzion Kollel offers this unique program to the St. Louis community. 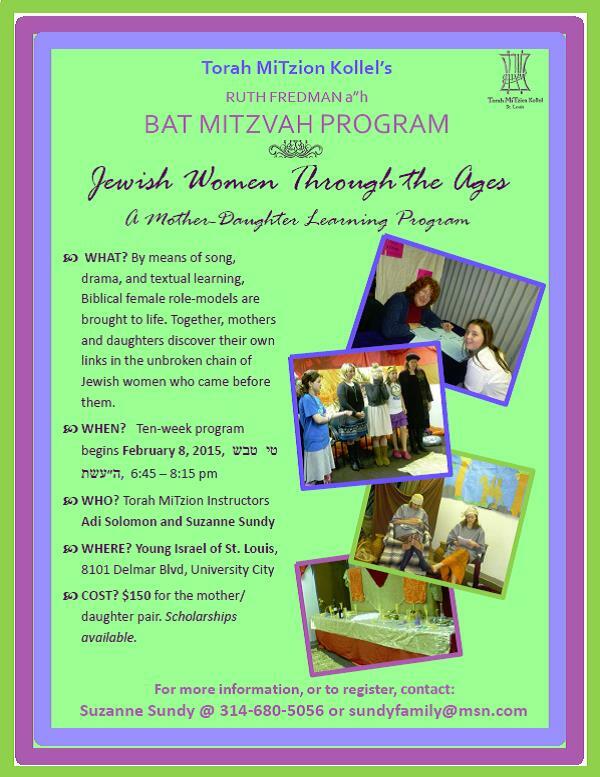 Join other mothers and daughters as you connect with Jewish sources and experience the excitement of learning through each others’ eyes. 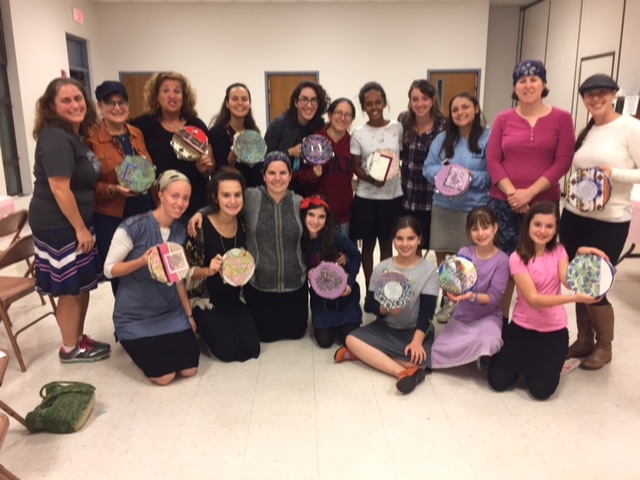 Centered around the theme, “Jewish Women through the Ages,” the Bat Mitzvah Program explores the lives of Jewish women who embody the midot (positive attributes) and values to which we aspire: Rivkah, Miriam, Devorah, Hannah, Esther, Bruria, Dona Gracia, and Nechama Leibowitz. In addition to textual study, the program uses creative techniques such as dramatic reenactments, art, guided imagery, and music to gain insight into the lives of these extraordinary women. In the process, the Bat Mitzvah girl develops her own identity as a Jewish woman. MaTaN in Jerusalem, is an ideal way to enhance your mother-daughter relationship as you both become partners on a spiritual journey. 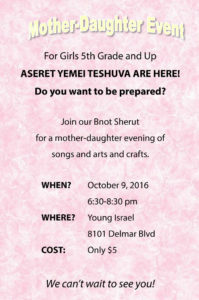 Each session includes mother-daughter chevrutah (paired) learning, a shiur (structured discussion), and varied activities. All source materials are provided in Hebrew with English translation. Sessions will by led by Adi Salomon, with her trained staff. Learning skills will be developed at each individual’s level. 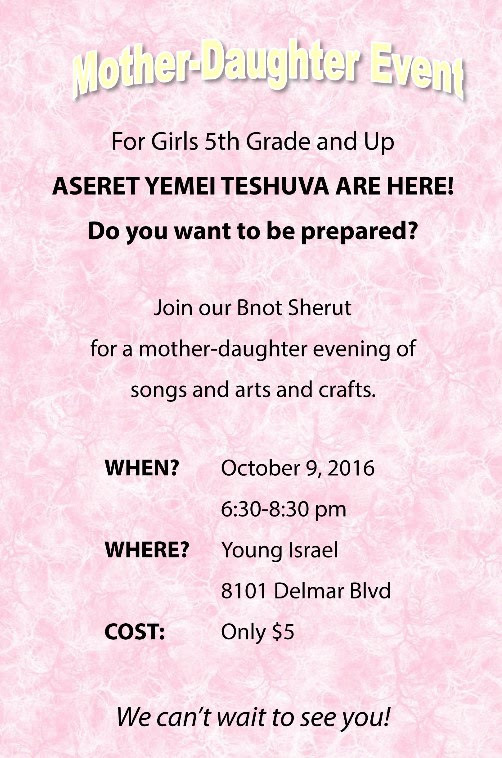 Meeting weekly at Young Israel (8101 Delmar) and concluding with an evening ceremony of celebration.